And lens caps are downright cheap, so there is no excuse not to have a few spares. For those new to the forum, I would urge you to put a lanyard on all of your devices. While the tubes are robust, if you drop one on to a hard surface, it can be damaged. I always pick up my device and put the lanyard over my neck before I do anything else. If I am going to let someone use the device, I either put the lanyard over their head and around their neck before handing it to them, or I give them the lanyard and ask them to wrap it around their wrist. When they give it back, I ask them to hand it to me, and once I have it in my grip, i ask them to release the lanyard. The very vast majority of the value of this device is in the tube, and if you drop it and damage the tube, you will hate yourself. Edited by Eddgie, 29 August 2016 - 09:00 AM. I have been advised that this is a precautionary step to protect the tube from sun hitting the photocathode. Great suggestions! I am using around-the-neck lanyards provided with ID badges I have obtained at various trade shows which are wide and distribute the weight so they aren't uncomfortable after hanging off your neck for a period of time. Many also come with convenient metal swivel snaps which keeps the cord from tangling or twisting. Yes these are nice and you can also buy Binocular shoulder straps. Does not matter exactly what one uses, but one should use something and be diligent about it. I use the shoestring for a lanyard and put a piece of Velcro on the outside of the cap to cover the pinhole, and in use stick it to a mating piece of Velcro on the device to keep it from getting lost. While the NV market may be small, I know that Richard and Tyler both want to be seen as the go-to provider for this community. It sure is fascinating to see the cascade effect referring you to Richard of Ultimate Night Vision has had here on CN. From what I've seen, referring you to Richard of UNV has not only given you the preeminence you've sought since picking up your first NV device but has greatly benefited the NV Astro community here on CN and likely outside the CN as well. Though the referral to you was a blind one, based only on the gentlemen like manner in which Richard and Tyler have conducted themselves elsewhere, often in extremely hostile environments, they are certainly deserving of the trust many here given them or may be giving them. I'm certainly impressed by UNV, I've never seen an NV company in the 12 years since getting involved in NV be so willing to adapt and truly serve all customers. Edited by cnoct, 30 August 2016 - 09:17 AM. Your referral was invaluable. I soooo appreciate it!!! I was struggling before you recommend I contact Richard, and even then it still took many weeks to get it all done, but prior to that, I was dead in the water for tubes. For my part, I did spend some time with Tyler showing him the various configurations and teaching him about how to work the fitlers and and why C mount was important to us(easier to undersand when you see the various configurations) and he was quite interested in what we were doing with NV and I also think this made him more aware of the fact that this market could be pretty particular in terms of what we want and need from our gear. You were instrumental in my own success though, both in encouraging me to be patient and in pointing me to Ultimate. I can't thank you enough!!!! Excuse my ignorance, but exactly which L3 filmless WP monocular is it that everyone is ordering from Ultimate Night Vision? When I look for Mod 3, it only shows the binocular configuration for $6900 - $8,000+, but if I search L3, it brings up the PVS-14 as well as the Mod 3. Not that I can afford this now, but for future reference it would be nice to know what I am looking for. Excuse my ignorance, but exactly which L3 filmless WP monocular is it that everyone is ordering from Ultimate Night Vision? The monocular is being unofficially referred to as the 'MOD-3c', at least that's what Edggie and I started calling it in our communications. The 'MOD-3' monocular component refers to a single optical pod of the MOD-3 binocular system, though in monocular form the optical pod is attached to a removable power pack. Night Vision Depot has some good photos of the system sans c-mount interface. 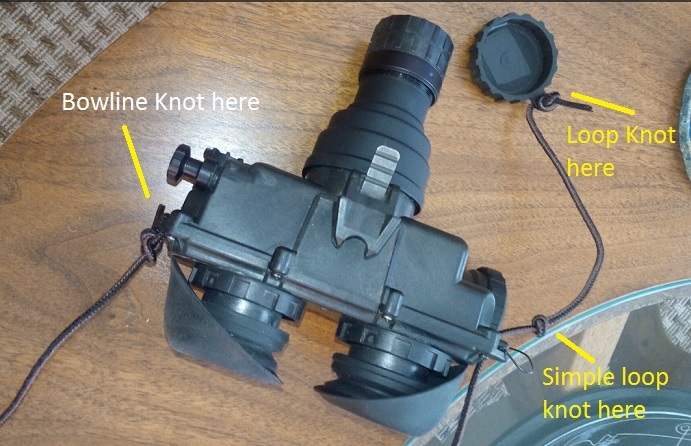 The NVD offering is designated as an MNVDG and uses the AN/PVS-14 objective instead of the c-mount interface of the unofficial 'MOD-3c' monocular. As for L3 Unfilmed/Filmless image intensifiers, L3 unfilmed tubes either P43(G) or P45(W) have the high performance potential of any image intensifiers and are the highest performing tubes in the world. Period! Excellent information, as usual cnoct, thank you! You also cleared up another misconception that I had; that is, that the PVS-14 does not use a c-mount. For some reason I thought that it did. So, when I eventually call Ultimate Night Vision, I am asking for the MOD-3c monocular with L3 filmless WP. Could be awhile, but I am glad to now know what I am looking for. Ron, thanks for that post. I had forgotten all about the original MOD-3c thread. Excellent information, as usual cnoct, thank you! You also cleared up another misconception that I had; that is, that the PVS-14 does not use a c-mount. For some reason I thought that it did. 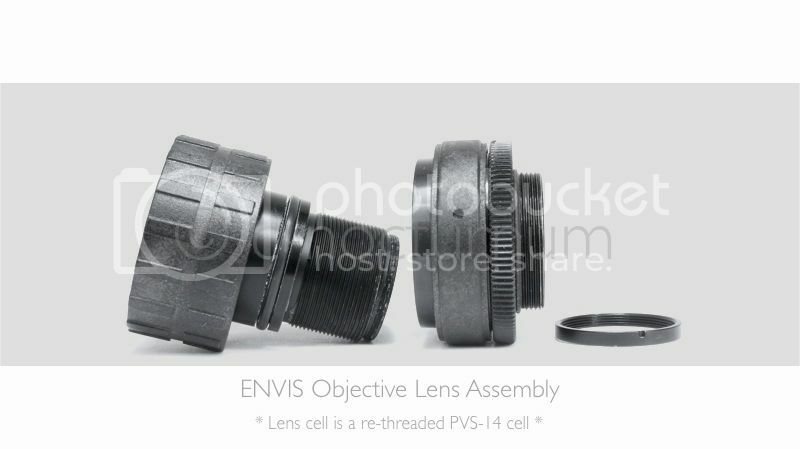 Well technically the ENVIS objective is nothing more than a custom threaded AN/PVS-14 objective from AVIMO and male c-mount adapter. Without the c-mount adapter sleeve, the ENVIS lens wouldn't even be compatible with the c-mount interface. I can totally understand how such a misconception would come about, so no worries. Tonight I will see if I can't characterize the texturing I noted earlier. Rich has a great guy to work with thus far. And, he owns a scope of his own and understands astronomy. I'm confident of a favorable resolution. When I looked at "bright" surface (a painted wall) with the gain turned up, I was able to see exactly what was going on - honeycomb. My First Light night was about 50% cloud coverage. And being a NV Rookie I had the gain way up - which was why I started to detect the issue then. I was a bit upset about this at first. In talking with others I learned that this an inherent artifact of the way the device is constructed. Somewhat similar to being upset about light creating a diffraction pattern when it enters an aperture. No avoiding it, and useless to worry about it. Nevertheless, I spoke with Rich at Ultimate Night Vision about the issue. He told me about the same thing, and you could go through a hundred tubes and find it in each one if you looked hard enough. Maybe one in several hundred have the feature so faint you can't see it. Rich offered to take the device back. A+ for customer service attitude on his part. Under the darker skies, the honeycomb was not seen. However, when I shifted my eye to attempt to focus on the interior of the NV tube (as opposed to relaxing to distance-focus to see the sky) I could find some hint of "texturing". I think what I was beginning to perceive was the "intersections" of the honeycombs, an appearance of dots. But to emphasize, with gain at normal settings I really had to search for it. In some respects, this is typical of the obsessive-compulsive nature most of us seem to have - buy fine equipment and keep pushing it hard to see the inherent aberrations or flaws. But in the course of normal observing ... not really an issue. 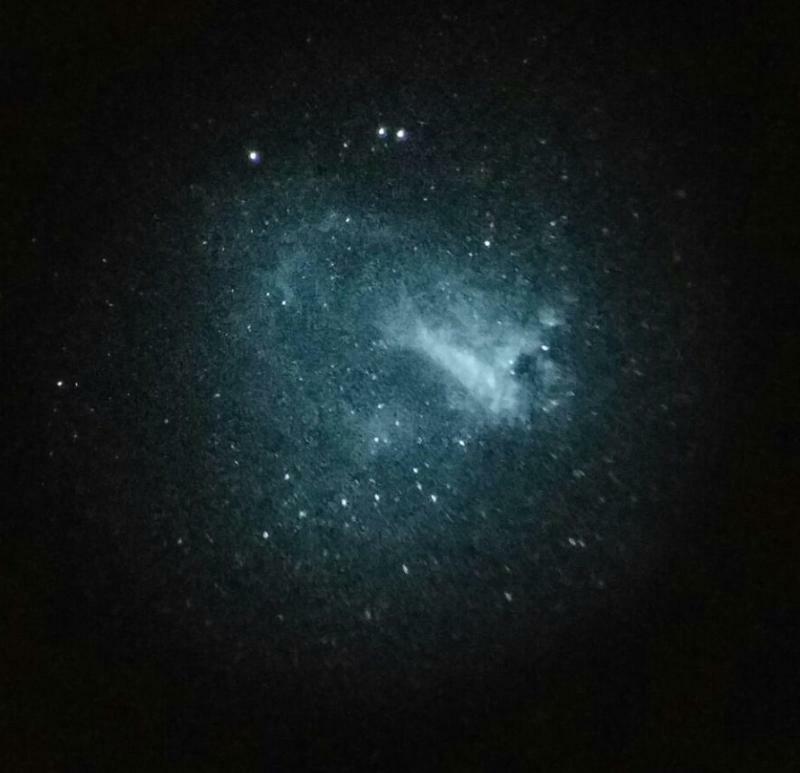 So, bottom line is the NV eyepiece is showing me things better than I have ever seen in 35 years of amateur astronomy. By a very large margin. I'm keeping it! As with the narrow apparent field and the scintillation, these kinds of things seem to disappear once you get to actual observing. I have a very bad emission point (looks like a tiny glowing doughnut) in the field of one of my PVS-7s. When it first happened (see lanyard post above) I was quite mortified, but in practice, I rarely even notice it! And yes, you will see things you did not even know existed, and you will see things that you never thought you would ever be able to see. Hope you have a blast with it! One tip on the SCT at f/10 for next time: a screw-in 0.5x focal reducer should work fine. I used a 2" diameter one on my C11 and there was no coma or ill effects. Yes, the view through the C11 with the focal reducer was excellent! At the star party you did when I first met you, I had a chance to use my PVS-7 in a C8 that one of your friends brought to the dam and even at f/10, views of M81 were (in my opinion) considerably better than the view through the C8 using regular eyepiece. The galaxy was much brighter and more extended, and the structure of the notch was more easily visible and more distinct it shape. Scintillation was worse, but without doubt, I felt that the amount of detail was much better. The picture of the Swan we took using the WP tube was as I recall taken with the Mod 3 WP using your focal reducer as well and the views were quite excellent even though sky conditions were not particularly great. While the SCTs won't be as fast as most Newts with a focal reducer,, you can clearly get excellent results with it. Not bad for a C11 with a focal reducer and hand held using a cell phone.. Not bad at all. One of the best views of Swan I have ever had. Finally got a couple hours of observing in tonight, with the new white phosphor filmless tube, and the new (to me) Stellarvue 80mm f/6 APO on an alt-az mount. The atmosphere is muggy tonight, but at least there was no moon light! I had a grand ol' time, and I enjoyed the views through the WP tube very, very much. The manual gain control is indescribably wonderful, and is now a must for me. Both at 1x and through the scope, I really appreciated being able to trade off between scintillation and brightness. Edited by pwang99, 04 September 2016 - 12:53 AM. Link does not work and I am dying to see the picture! Yes, has been miserable the last couple of weeks. Very hazy, hot, and sticky. This is one of the worst late summers I can remember. I have not even been driving out to Mansfield because I just did not think it would be worth doing. Edited by Eddgie, 04 September 2016 - 08:50 AM. Ok, here is the photo as a direct upload. Stars even out to the edge look pretty sharp. 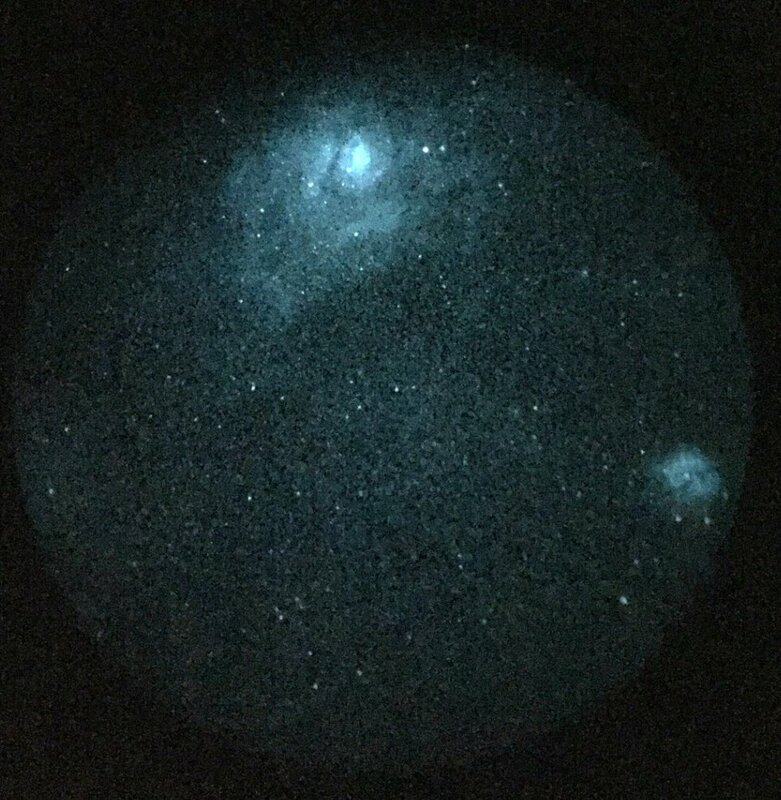 Was this a simple afocal image with a camera held up to the eyepiece or were you using some kind of relay lens?? I did try to use a new iPhone eyepiece holder contraption, but it didn't quite work out and I ran out of patience. I'll try fiddling with it more in the future. Ha ha.. Not bad for afocal pic with an eyephone. Gotta love it. Narrower pass H-a is in my very near future. I have not been motivated to get out much though because conditions in town have been sucky. Heavy smog haze and sticky humid. Is it any better out by 360??? Excellent report and thanks for the new images. I was out last night and only had so-so conditions. I am sure that much of what affects the views from the city is tailpipe induced haze. I notice that it abates some at 10:30, but on these nights with no breeze to scrub it from overhead, you really loose a lot of transparency. Sounds like however less than ideal your conditions were in Liberty Hill, they had to have been much better than here. Worst August I can ever remember. Summer in Austin is getting impossible to observe. Such bad haze. I may wind up with a transfer lens and a CCD camera. I hated imaging before, but I think I would image with NV maybe. Just a lot easier. I've having a blast experimenting with my Canon lens on my Mod 3 C-mount. My Canon EOS 60mm Macro gives such sharp views! Though I prefer the Canon 18-200 zoom because of the range. Is there an equation to help determine what magnification you get with the lens. I think my Canon 60mm is giving me 2x. Also, which relay lens can be connected to the Mod 3 C?